Often, clients ask whether or not it is really helpful to explore past unresolved issues. It is okay to question whether going back into the past is pertinent to being in your life right now. I believe that most often it is since the past is often symbolic of the present. The past may hold a trigger or hook as related to your current situation. Even though you are living right now, it is often helpful to work with feelings about past events. Often painful, unresolved issues affect what is happening in the present. 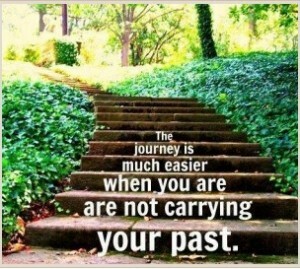 When you work through past issues, it does not mean that you are going back to live in the past. Often when you return to old memories, you will find that something is crying out for release. A technique that may help you is to allow yourself to go back to a particular painful incident and bring it into your awareness as you sit quietly. State the intention that you will review the incident from the “Witness” standpoint. What if you could hover above the scene and view it? As feelings come up, stay the witness to them. If there are certain issues that feel too painful to move into, they are usually the most pertinent ones that are needing attention. They are also possibly influencing you in ways that you may not suspect in the present. What was the meaning of them in the past? What is the meaning now? How is your current situation like and not like the past? When you go back into the past, you may or may not gain understanding right away. Most importantly, just allow the feelings to come up and experience and accept them. This will help to integrate the feelings, and understanding will most often occur as a result of integration. And then there is the question of “When is enough, enough?” If you start to find that there is “power” in your wound, you will hold onto it. That type of power is not true power. So, yes, when you “feel” that you have moved through the feeling (and I think you will know when this occurs), you move on.